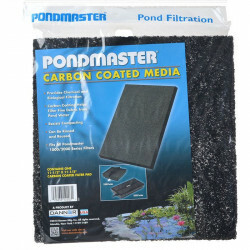 Pondmaster replacement Carbon coated filter pad and Coarse polyester media pads are the original replacement media for Pondmaster 1000 and Pondmaster 2000 filters. 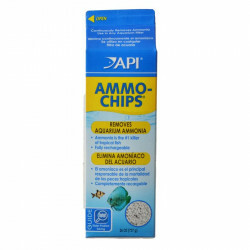 This complete set of filtration pads provide biological and chemical filtration. It is recommended that the Coarse Polyester be used as the first layer and the Carbon coated material as the second layer. This produces a gradual filtration process. Pet Mountain is proud to offer discount bulk pet products. These filters is all I use, I've found that other filters do not stand up to the quality and cleaning power as these do, I've always had trouble with keeping my 875 gal pond clean til I tried these filters, I have a 30 gal barrel filtration system on this pond but it just doesn't keep it crystal clean like I want it. Til I added the pond master filter media, it removes algae like no other. Thank u pet mountain! I have used this in the past. Works great! Fits perfectly and is exactly what I was looking for, at a great price. 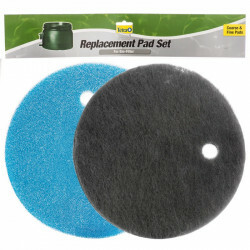 These pads for the pond filter are easy to find but it is very convenient to be able to buy them online and have them delivered without having to go and get them. The price is slightly cheaper as well compared to most local places. These were exactly the right set of pads to clear up our pond. I have a Pondmaster 2000 so it took two sets of pads. They fit correctly and cleared up the pond quickly. My other small filter kept getting clogged with muck. So I got our old Pondmaster 2000 out, got these replacement pads in and now the water is flowing fast and clear. These don't get clogged up with the pond muck and allow the good bacteria to grow. Great price from Pet Mountain so I bought an extra set. I WAS VERY SATISFIED WITH THESE POND FILTER PADS. THEY WERE JUST AS I EXPECTED AND THEY WERE SENT WITHIN THE TIME I WAS TOLD I WOULD RECEIVE THEM. THE BEST THING IS THE PRICE, WHEN I BUY LOCALLY THEY ARE ALMOST DOUBLE. SO I WILL BUY THESE NOW ON FROM YOUR COMPANY. Great price and was exactly what we needed. We stocked up for the whole year. No more running around looking for a filter every month. Very quick ship. We really liked the way the Pondmaster filter kept our pond clear all summer. This is the first summer that we did not have green water. This product is great!! Keeps the pond so clear. Usually only have to clean about once a week and no need for other clearing products (liquids) in the pond water. We love it and glad we can find a replacement for ours. Pondmaster Filters are easy and work great! I use a Pondmaster filter for my small pond with a 1/2 barrel waterfall. The 2 pack carbon and course pad work very well and I am able to clean them and re-use them. Pet Mountain is the best price and cheapest delivery charge, I've found anywhere.Highly recommended!!! I was expecting two 4"x11" x 1&1/2inch thick black foam pads and the 11"square by "1/4 to 1/2 inch thick white coarse filter material used in new Pondmaster filters. 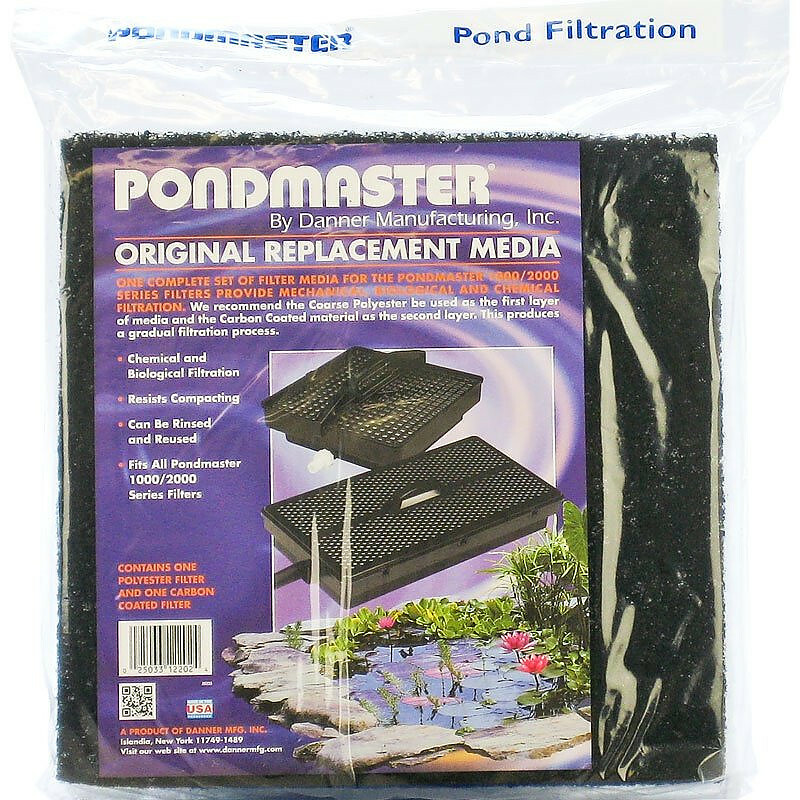 Your product says it is "Supreme Pondmaster Original Replacement Media", but it consists of a 1"thick by 11&1/2" square white coarse polyester pad and a 1/4" thick by 11&1/2" square carbon coated polyester (I think) pad that has a tighter "weave" than the white pad. When I ordered, your site said the replacement media was approximately 12 inches square. No Thickness was given.